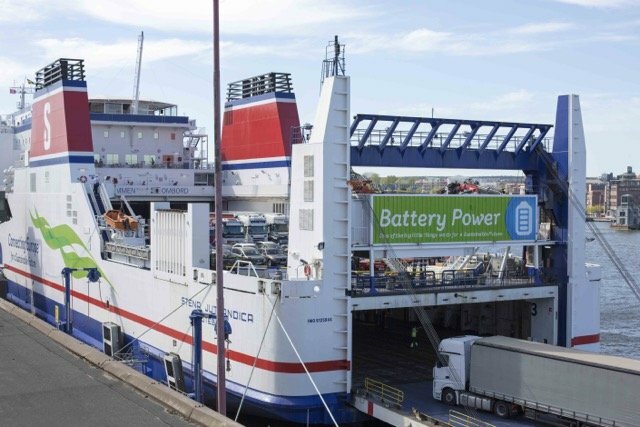 eMobility has hit the high seas as the Stena Jutlandica has now completed its first month of operation as a battery hybrid vessel and the positive experiences from the first weeks of service have exceeded expectations. “It’s really exciting to be running with electrical power on the Stena Jutlandica. This project is an important part of our focused efforts to find ways of reducing our impact on the environment. As both the size and cost of batteries decrease, battery operation is becoming a very attractive alternative to traditional fuel for shipping as it should be possible to completely eliminate emissions in the future,” said Erik Lewenhaupt, Head of Sustainability at Stena Line. The battery project is being carried out in steps. Step One, which is presently underway, is about switching to electrical operation to reduce the use of diesel generators, as well as for manoeuvring and powering the bow thrusters when the ship is in port. In Step Two, battery power will be connected to two of the four primary machines, which means that the Stena Jutlandica will be able to run on electrical power for about 10 nautical miles inside the archipelago out to Vinga Lighthouse (Gothenburg, Sweden). During Step Three, all four primary machines will be connected to the batteries and the ship will be able to cover the 50 nautical miles between Sweden and Denmark solely on electrical power. A number of positive effects have already been noted after just one month. “We’ve been able to significantly reduce our use of the diesel generators and now only need to use one instead of three. Another positive effect concerns safety. Having constant access to electricity, we minimize the risk for power outages,” added Johan Stranne, Senior Chief Engineer on the Stena Jutlandica. In Step One alone, the environmental savings from using battery power for reduced generator usage and manoeuvring in port amounts to approximately 500 tonnes of fuel saved and 1,500 tonnes of reduced CO2. This corresponds to the annual emissions from approximately 600 cars. The rationale for execution in multiple steps is to enable testing and assessment while the project is underway. If the project is successful, battery power can be considered for other vessels within the Stena Line fleet. Work on Step Two has begun and the goal is for implementation within approximately three years. The technical solutions in Step One have been developed by Stena Teknik in collaboration with the Callenberg Technology Group, with half of the funding for the project coming from the Swedish Transport Administration and the EU.